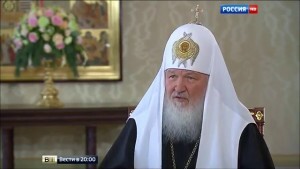 The head of Russia’s largest church has said that terrorism is the response to a godless civilization with Gay prides. — ЛГБТ-служение "Nuntiare et Recreare"
The head of Russia’s largest church has said that terrorism is the response to a godless civilization with Gay prides. You are here: Home / Pелигии / Xристианство / The head of Russia’s largest church has said that terrorism is the response to a godless civilization with Gay prides. On January 7th 2016, the Russian state-owned TV channel “Russia 1” broadcast an interview with Patriarch Kirill who heads the Russian Orthodox Church, the country’s largest, most influential religious organization. During the interview, he shared his opinions on the motives of terrorists whose actions, in his mind, are a reaction to the rise of a godless civilization, which welcomes Gay prides. The interview was recorded for Christmas, which is celebrated on January 7th according to the Orthodox calendar. Taken from the Russian Orthodox Church official website, January 7th 2016 for inclusion on Nuntiare.org.